No Cuts to ESOL, No Cuts at All! Government cuts in ESOL funding could devastate language provision for people who don’t speak English as their first language. This is the latest in a series of attacks to the already limited services that migrants and asylum seekers can access, and part of the wider attack on education, jobs and public services. 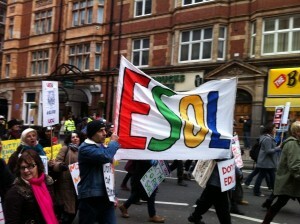 to protest against the Government’s policies on ESOL. There will rallies, marches and events all over England. In Newcastle, a march, co-ordinated by Tyneside Community Action Against Racism, will take place at 4.30pm on Thursday 24th March, beginning at the Centre for Life, near central station, city centre, and ending with a rally at the Monument. The march is on the same day as strikes by college and University lecturers in protest at education cuts. 2011, only those getting JSA and some receiving the new Employment Support Allowance, will be entitled to free classes. Funding for ESOL programmes has been cut by 50% over the last three years. The cost of classes is expected to rise to around £900 a year. services, support their children in schools or to participate in society. the UK and are keen to contribute to society.